The Senate yesterday went into a rowdy session following a motion moved by Senator Dino Melaye and co-sponsored by seven other lawmakers on the obvious militarisation of the 2019 elections. The upper chamber became raucous when the Minority Leader, Sen. Biodun Olujinmi, stood up to calm nerves that became frayed following the movement of the motion. Meanwhile, the Senate in the 4-point prayer, moved by Melaye, urged President Muhammadu Buhari to assent to the recent amendment to the Electoral Bill. This, the Senate said, would create a level playing field for all political players and ensure adoption of equal standards in the country’s elections for a strong and peaceful democratic experience. 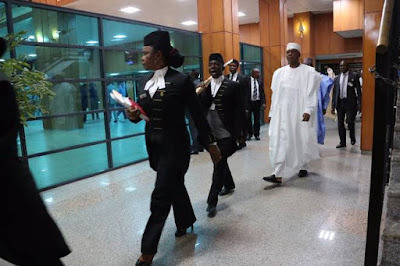 The upper chamber further condemned the massive use of the armed forces in the electoral process during the 2019 elections in the country. It urged INEC to ensure the unrestricted and consistent application of all electoral laws without bias to a candidate or a party in all elections. It directed the Senate Committee on INEC to investigate perceived inconsistent application of electoral laws in the 2019 elections. 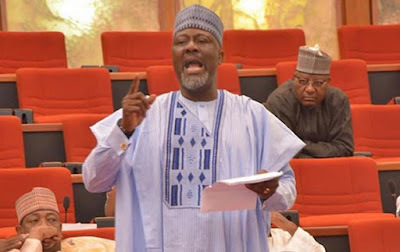 Presenting the motion, Senator Melaye had described as worrisome the militarisation of the Nigerian electoral process and the inconsistent application of electoral laws by INEC. He said that it was paramount to grow the country’s democracy through institutionalisation of procedures, application of civil laws, and the restriction of excessive use of the military in civil affairs. “We are aware of the growing militarisation of our nation’s electoral process and the inconsistent application of electoral laws by the institutional umpire, INEC. “The presence and use of extreme military force akin to war was applied in electoral polling stations and the declaration of elections inconclusive. This poses serious threat to our democracy and has security implications that must be nipped in the bud. Melaye, who said the country was on the edge of a precipice, called for the erection of strong institutions that could operate within established laws. Speaking on the motion, Senate Leader, Ahmed Lawan, said the essence of having a legislature was to provide legislative intervention to smoothen governance as well as ensure fairness and equity. He said: “The challenges of election have been with us for a long time and we should look at the issues that we know truly require the intervention of the legislature. Our process remains a journey and it still requires a lot of fine-tuning to get it right. “The Executive is equally concerned. We should use the opportunity to speak with INEC to evaluate the total situation to know what to address. “We should review what happened and see where legislative and executive interventions are required. “When INEC postponed the elections (Presidential and National Assembly), we were sad and we felt we should find out why because it has become a trend which leads to loss of lives and property. So, we should invite INEC chairman to hear from him,” he said. While seconding the motion, Sen. Olujinmi had stated that what happened on March 23 had been properly captured by Melaye. She said: “We are Nigerians and for the country to be a safe place we must not be partisan because what is wrong is wrong. Whoever is supporting what happened because of partisanship is not fair to the country and our unborn children. The election was a sham."